Self-catering Whitianga holiday home right on the beach. 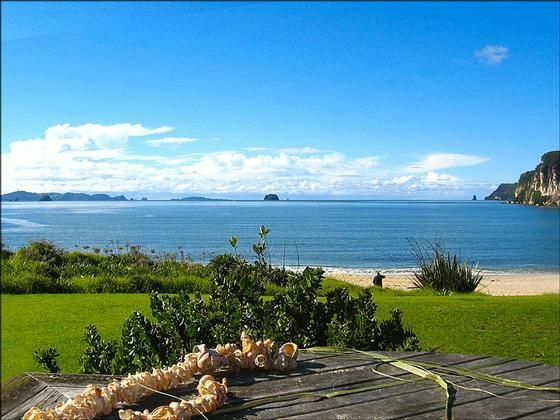 Prime seaside location at Front Beach, Ferry Landing on the east coast of Coromandel - 15 seconds walk to beach. This holiday home has pristine views of Front Beach and Mercury Bay. Private family-style holiday accommodation with own ocean beach access just metres away - stroll across the lawn and you're on the sand! Two kayaks are available for your enjoyment. Two self-contained units: one 3-bedroom main bach and one 2-bedroom,available individually or together for larger groups. Separate bunkroom. Ample parking for cars, small boat, trailer. Rental rates available on request. Safe swimming, boating, fishing, diving, scenic walks, guided tours and nearby wineries and restaurants. Short drive to Hot Water Beach and Hahei. Handy to Whitianga coastal township and local services via 5-minute ferry crossing from Ferry Landing wharf, a short walk from holiday home. Superb ocean views of Mercury Bay from most rooms and sun decks of holiday home. On a clear night, the moon and stars are something else! Clean sand/shell beach, with several reefs exposed at low tide. Amazingly sculpted volcanic-ash cliffs and rocks. Mussels can be gathered from the rocks at low tide, or dive for them off the point. Some good sized snapper have been caught off Front Beach. Small craft can be launched from Front Beach or adjacent Flaxmill Bay in suitable conditions. Mercury Bay is a blue expanse of ocean, with islands such as Ohina, Middle Island, Needle Rock, Rabbit Rock, Hole-in-the-Wall. An adventure playground on your doorstep. Front Beach, Whitianga, Mercury Bay, Coromandel. Location: Whitianga and Front Beach are about 2.5 hours by road or a 4 hour trip by launch from Auckland. It's easy to forget Auckland city, any city, after a few days in this paradise. Water conservation is essential as we rely on tank water. Linen: All beds come with duvet and pillowcase covers only. Bottom and top sheets and your own pillow cases to be supplied by guests and used on all beds. No towels/tea towels are included in the rental Linen is available for overseas guests at an additional charge. Full set of dishes, pots, utensils etc. Location amazing, right on the beach. Safe swimming beach for kids. Main house (unit 1) very well equipped and recently decorated. Unit 2 needs a bit of love. We had 4 adults and 4 kids and based ourselves in unit 1 and only used unit 2 to sleep 1. Great spot, would love to come back one day. The location right on the beach was superb. The location right on the beach was superb. It was a short walk to the ferry and a place selling coffee, but the view from the deck was so lovely we spent most of our time there. Unit 1 was our main cooking and living area and had a well equipped kitchen. The beds were good. We had a wonderfully relaxing enjoyable time there. Great spot. Photos don't do it justice. We will be back!